Peak Physio Staff / February 2, 2019 / Comments are off for this post. Cities are full of studios dedicated to it, most gyms have several classes and new Mums take their bubs along to baby friendly sessions. Pilates is a health trend that has stayed the course and it certainly doesn’t look like it is going away anytime soon. So, what exactly is Pilates and why does everyone rave about it? Joseph Pilates was a German physical trainer who began practising exercise and athletics as a child to combat his asthma and other assorted ailments, including Ricketts. In 1912, while Joseph was working in England at Scotland Yard teaching self-defence, war broke out and this resulted in Joseph and other German nationals being held captive as “enemy aliens”. While confined, Joseph developed his innovative technique of exercise using springs as resistance. Joseph later moved to the United States and, with his wife Clara, opened his first studio, where his technique became popular with dancers who were wanting to improve their awareness of movement and rehabilitate after sustaining injuries. He passed away in 1967 and some of his students began teaching and carrying on his work. Soon Hollywood celebrities were catching on to the benefits of Pilates, which is always one of the fastest ways for a new trend to grow in reputation! Pilates has remained a firm fitness favourite with A-list celebrities and athletes, as well as the general population and will probably continue to be for the foreseeable future. The versatility of Pilates is one of the many reasons that it is so popular. Participants can either perform sessions on a machine that looks like an ancient torture device, known as a Reformer, or carry out floor-based exercises referred to as “mat work”. The beauty of mat work is that it’s a completely portable form of exercise that can be done anywhere – at home, in the backyard, or even in the office. Reformer Pilates refers to a practise on a spring-loaded table, which has various platforms that can be moved to provide different working surfaces. The innovative spring mechanism means that resistance levels can be quickly modified by adding or removing springs. A Trapeze Bar can be used for upper limb workouts and participants can either lie on their backs, kneel up against the shoulder pads, or even go on all fours to complete their movements. The Reformer is a remarkably versatile device and, with appropriate guidance, can be utilised to create a wonderful whole-body workout. Pilates is appropriate for all experience levels, from beginner to expert, as all movements are scalable with various progressions and regressions. While Pilates has particularly ‘caught on’ with younger women, it can be used effectively by both men and women of any age. As with most exercises today, many Pilates videos can be found on the internet via YouTube. One thing to consider, though, is that when you do Pilates via video in your living room you don’t have the benefit of an instructor assessing your technique and giving feedback. This inevitably increases the risk of injury and will usually mean a less effective workout. As a low impact exercise, Pilates is the perfect choice for many patients who find exercising painful due to knee or hip pain. Choose the right exercise and you can simultaneously work on strengthening and increasing the flexibility of the legs. The low resistance level of Pilates reformer springs reduces the load through the joints and most movements are performed horizontally, making it great those with leg problems, who may find weight bearing too painful. 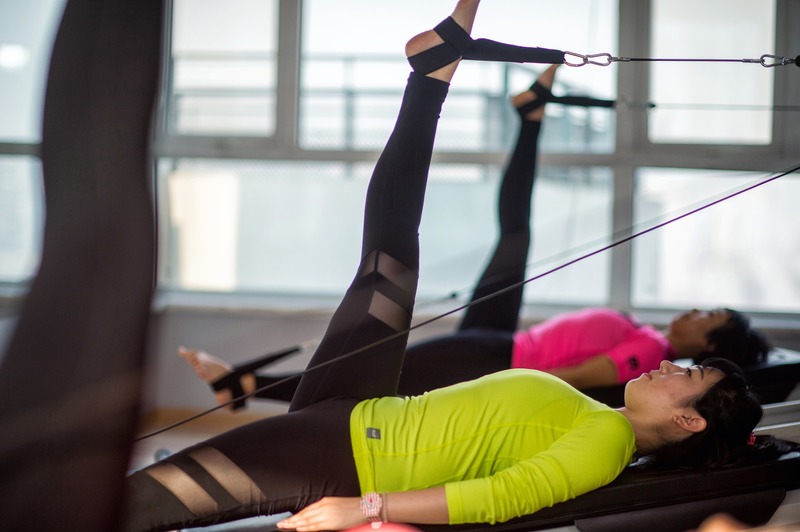 Pilates allows the use of “closed chain” exercises (which means that the foot is fixed and doesn’t move), a technique pivotal in various rehabilitation programs to reduce shearing forces through the joint. This is the case for patients after having a reconstruction of the anterior cruciate ligament (ACL) in the knee, as closed chain exercises place less strain through the ACL graft. Pilates is also useful for eccentric strengthening, where the muscles are under tension whilst lengthening, important for improving the control of the knee. Control is just as important as strength, but unfortunately often forgotten, and is especially critical in sports where jumping and landing are involved. Pilates’ focus on control of movement, as well as alignment and symmetry, makes it a very handy rehabilitation tool. A strong core can assist with many activities of daily life, such as sitting, standing, lifting, climbing, bending and squatting. In contrast, if the core is weak, daily activities becoming more challenging and an individual may be at increased risk of developing back pain. The core consists mainly of the deep abdominals and back muscles, but also the glutes and pelvic floor muscles. The gluteal muscles assist with core stability and pelvic alignment, and they are often found to be weak in patients with back pain. They are frequently a focus of Pilates training, as strengthening the glutes can take pressure off the spine and improve posture. The pelvic floor muscles are responsible for supporting the bladder, bowel and reproductive organs. All Pilates movements start with engaging the pelvic floor and deep abdominal muscles and trying to maintain a contraction throughout. Another (popular) bonus of core strengthening is it can result in lean abdominals and Pilates-style routines are seen to be more effective than sit ups and crunches, which only target the superficial abdominals. Posture can be a difficult issue to treat due to the long-term nature of forming the guilty habits. Pilates can be used to correct movement patterns, especially focusing on thoracic stability, shoulder movement, scapular positioning and stretching the chest muscles, which, when tight, can cause the classic ‘hunched’ posture. Pilates may even be a useful strategy for treating respiratory patients with hyperventilation syndrome by improving their thoracic posture and movement patterns in conjunction with their diaphragm activation, almost ‘re-teaching’ them how to breathe. Pilates is often credited with giving its disciples long and lean limbs. Muscles are gently elongated during Pilates, increasing their flexibility, which is one reason why it’s so popular with dancers and performers. It’s not just muscles that benefit from Pilates, but joints as well. By providing smooth movement through the entire range and being able to push further into possible stiffness and restrictions, joints and muscles become more flexible allowing greater and more controlled movement. Since Pilates is typically performed either on the floor or on a reformer, it is a wonderful choice for those with poor balance, as there is a low risk of falls. Being low impact means it is also incredibly safe for older patients. The fluid nature of Pilates exercises can help increase dynamic balance, which is an important factor in falls prevention treatment. While standing exercises are the most effective at improving balance, seated and lying exercises can still be helpful. By doing mat work, patients can also practise getting on and off the floor, a move that is challenging for many elderly patients and a useful skill to have for those at risk of falls. Muscle imbalances can rotate the pelvis causing it to be uneven and, thus, affect mobility and contribute to low back pain. This can be seen in desk workers who spend large amounts of time sitting, causing tight hip flexors, rotating the pelvis forward, or in patients with tight hamstrings, causing posterior rotation. Pilates’ emphasis on symmetry, correct pelvic positioning and using both sides equally helps to strengthen weak areas, inhibit overactive muscles and correct any imbalances. This balance can then transfer into daily activities, making sure you’re using both sides of the body equally and your pelvis is in a position of neutral rotation. Hypermobility might seem useful if you’re a contortionist, but for the everyday person, hypermobility can mean increased injuries and pain as joints are lacking the adequate stability needed to function properly. Pilates is a great choice to treat hypermobility as it helps to strengthen and stabilise the joints in a low impact manner. With increased strength and control, the joints are supported and less likely to become injured with movement. The gentle nature of Pilates makes it a perfect choice for expectant and new mothers while their joints (especially the pelvis and lumbar spine) are adapting to ever-changing positions. Pregnant women have a hormone called relaxin circulating in their bodies during pregnancy – and for approximately 12 months post-birth. This hormone helps the ligaments of the pelvis loosen to widen as the baby grows and prepares for delivery, but has the same effect on all ligaments in the body, making them prone to injury and resulting in high impact exercise being unsuitable. Pilates allows resistance training without the same amount of strain placed through the lax ligaments. It also helps to re-engage the stretched stomach muscles after birth and is safe for women with diastasis recti, where other abdominal exercises may cause an increase in separation of the abdominal muscles. It’s effective at strengthening the core and pelvic floor muscles which help to reduce the incidence of urinary incontinence, a common complaint for many women after giving birth. The more you exercise, the greater number of calories you burn helping you towards achieving a calorie deficit, which is essential for weight loss. While Pilates is not unique in this, it’s a great option for people who find exercise difficult, perhaps due to medical reasons or carrying excess weight. Pilates is also often perceived as a more enjoyable exercise, as there is usually minimal sweating or becoming out of breath, which can sometimes put people off exercise. Despite this, it is still a very effective workout. The core strengthening component mentioned previously can help to tone abdominal, glute and leg muscles. Several of the above benefits combine to decrease the overall risk of sustaining an injury. By building up strength, mobility, proprioception and control, the body can withstand higher loads and avoid preventable injuries. This is especially important in athletes, whether they be professionals or weekend warriors. Many professional athletes use aspects of Pilates as part of their conditioning routine and especially during any rehabilitation program. It can focus on aspects of fitness that aren’t usually covered in most sports training programs and generally complements other training regimes nicely. Pilates allows athletes to adapt movements in a manner that they can still practise while injured – instead of resting completely, which would result in a loss of muscle strength and mobility. All exercise programs carry risk and the human body is complex. It’s best to work with an expert in human anatomy, movement and physiology, so it’s always recommended to seek out a physiotherapist or exercise physiologist for your training. This is especially true if you have any current or past injuries or any medical considerations which need to be taken into account. It is always best to start Pilates in a small group or even a private session, if possible, so that you receive more individual attention to ensure that you’re performing each movement correctly. The problem with large classes is that instructors can’t offer as much specific attention and may not pick up on clients performing movements with incorrect technique, which creates an increased risk of injury. Generic programs may be fine if you’re young, fit, completely injury-free and experienced with different forms of exercise. For most of us, though, a generic approach will be sub-optimal. It’s a cliché, but every individual is different. Consider your age, weight, body type, experience level, strength, flexibility, endurance, injury history, medical conditions, and preferences. Are these attributes the same as the person next to you in class? If you’re doing exactly the same thing as others and not getting close individual attention, it might be worth reflecting on whether it’s the right program for you. Pilates is everywhere and new studios are popping up all the time. If you’re just starting out, try to find a facility with a long trading history and impeccable reputation. Always prioritise quality. You’re ultimately investing in your health, after all. Pilates can be a fantastic tool when used effectively, so if you’ve been thinking about getting started, don’t hesitate to give it a try. Book in for an assessment with your physiotherapist and join a class today; your body will thank you.